Featuring all the coolness of a switchblade but completely legal to buy and own in all states, even California! Each knife opens with the press of a torsion lever on the side of the knife. Once the lever is pressed the knife snaps open quickly. These knives will make great a gift! 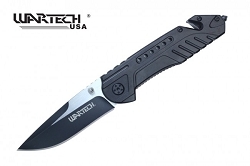 EMT knife is approximately 8 inches open, 3 3/4" blade. 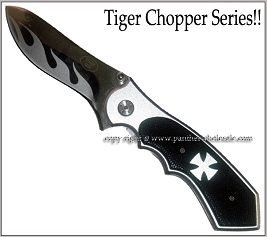 Matte finished black 440 stainless steel blade with half serrations. Orange aluminum handle with EMT medallion. Belt cutter and glass breaker style. This will come in handy in an emergency.